The “Kit” I used to run a session of Save Innsmouth: Chapter 0 at last weekend’s memorable Dragonmeet, minus the All Rolled Up game roll and The Cthulhu Hack dice tray. The players each had their character’s image – and name – out in front of them on a simple clear plastic stand. I wrote the name on with a dry wipe Correctable pen, which means I can reuse the pictures for a future con game. The images themselves came from a random Google Image search – then I made them all black-and-white. 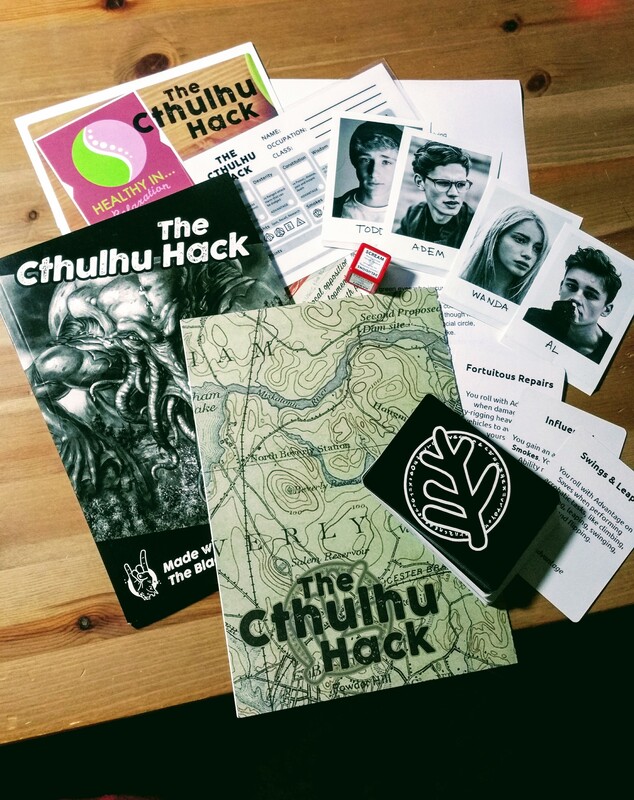 The character sheet in the image is the laminated version from The Cthulhu Hack Quickstart. Very handy – although, I actually used A4 blow-ups of the character sheet design to keep things clear and simple! The prototype deck of Character Generation cards worked out really well. 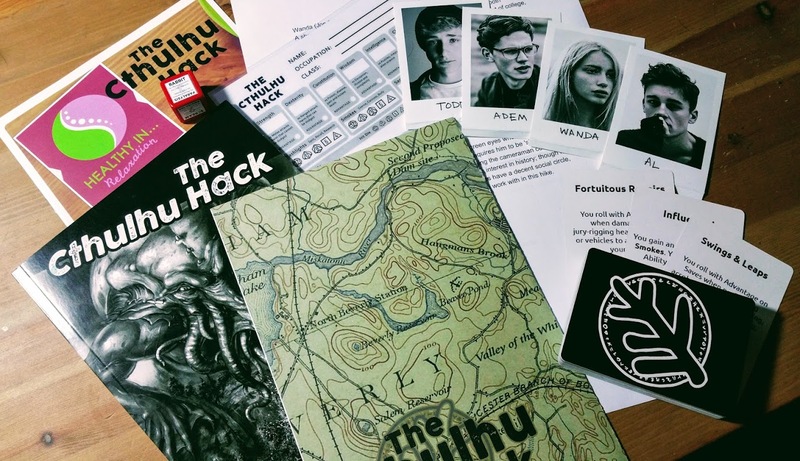 As players in the game have commented (on my Google+ Cthulhu Hack Collection), they meant you could quickly reference the character’s key Special Features and it could work really well as a rapid random character generator. Each card shows whether it’s an Ability or an Advantage – so, separate them and deal two Abilities and an Advantage to each player. Every possibility I will use Kickstarter or similar to fund the production of these card decks – so, keep an eye out for that one. And, the Gamemaster Screen – well, that’s a seriously prototype piece of kit. At the moment, I just have a bunch of tables from the core rules on the reverse. It has got me tweaking some of the tables, but at the moment I have a lot of thinking to do on what best to add on here for the benefit of an overworked GM! A lot of things to think about for 2017!